The LDS Church recently made changes to their temple endowment ceremony. Rumor has it that the Cutlerite endowment has changed very little since the death of Joseph Smith. We’ll continue our discussion about Cutlerite temple practices with Steve Shields. It appears they believe women hold priesthood in their temple ordinances! Steve: So, that building is, in all intents and purposes, it’s a temple and it would resemble the Kirtland Temple model except Kirtland had no font. But, the upstairs room for the priesthood on the second floor, they weren’t necessarily doing rituals there, but they did some washings and anointings upstairs on the third floor in the attic level. And so, on the second floor of the Cutlerite buildings in Minnesota and Independence, that’s dedicated as a holy place. They call it the upper room work. They don’t use the term endowment. They do know what that means because we’ve talked about it with them. But, I do know. They’ve told me this, that women are ordained as high priestesses in the celestial church, not in the outer church, not in the public church. They have no priesthood in the public church. 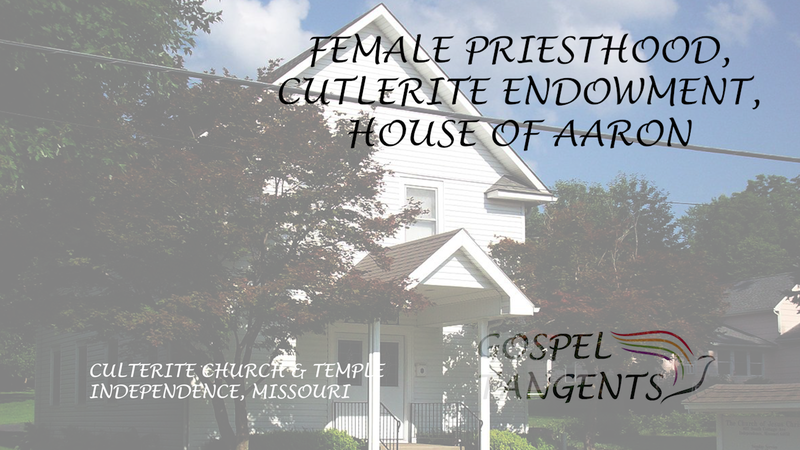 GT: Oh, so women have a temple priesthood, but not an Ecclesiastical priesthood. GT: That’s interesting, Michael Quinn, in my current interview, just kind of said the LDS have the same thing. Jonathan Stapley said, “Well, we don’t want to call it priesthood.” But Quinn wasn’t nearly as careful on that. Steve: Yeah. Well, I’m in the Quinn camp on that issue. We’ll also discuss a break off from the RLDS Church called the House of Aaron. Steve: The House of Aaron is based at Eskdale, Utah. And they used to be called the Aaronic Order or the Order of Aaron. Morris Glendening was the founder, promoter of that. In the recent 10 or 12 years, they’ve been having lots of conversation with Fred Larsen and the Remnant Church of Jesus Christ of Latter Day Saints. John Conrad, who is the leader of the House of Aaron, his father was Bob Conrad, who was the chief high priest successor to Morris Glendening as chief high priest. John has gone out to Independence many times with folks their church. They’ve shifted a lot since Glendening’s times in the ’40’s. They always said they were not Mormons and yet all of their members had been Mormons. Have you heard of the House of Aaron before? Check out our conversation…. Don’t forget out other conversations with Steve!